We’re still trying, for example, to understand the logistics behind a customer’s decision. For example, why are 99 cents and $2.99 fine for a reader to take a chance on a lesser known author’s title, but $1.99 (mid-way between those two spots) is a complete dead zone? Is it because you’re appealing to two completely different types of customers, and the isn’t any sort of overlap? We’ll keep you posted on what we learn. 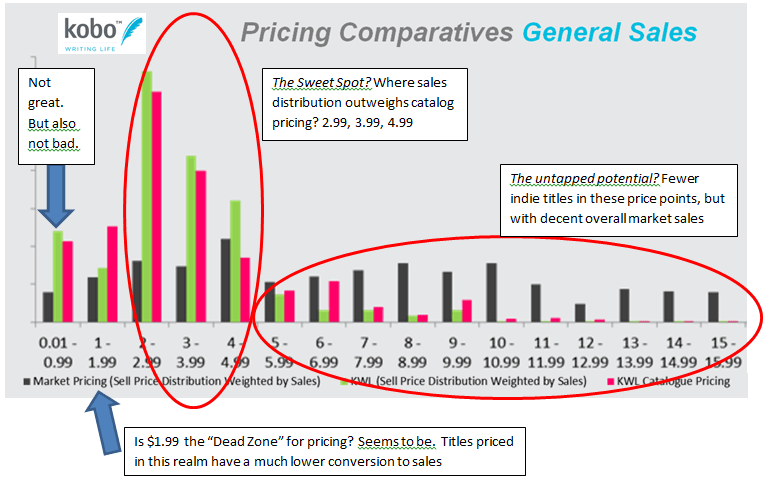 Before, KWL paid an author 70% of their Suggested Retail Price (SRP) if the price was between $1.99 and $12.99 USD, and 45% if the price was outside of that range. We’ve changed that: now, you’ll get 70% of your SRP if it’s $2.99 USD or above to encourage you to avoid the “Dead Zone” of $1.99. And yes, we are removing the cap on 70% — our cap used to be $12.99 USD, but now there is none. This means that for “box-sets” and other higher priced items, you aren’t penalized for pricing higher than $12.99. And it’s as simple as that. A quick little change to encourage you to value the hard work you’ve done and get the most out of your self-publishing endeavors. Here’s my conundrum: my books are small. They retail in print for $3.49-$3.99. I have my ebooks set at $1.99. Would they sell better at $2.99? I don’t know. I’ve been mixing it up a bit lately, but not seeing anything to indicate preference either way. Honestly, the stats tell us that $1.99 is a dead zone. Things simply don’t sell that well at that price point. Why, we’re not sure yet, but we’re trying to figure that out. The next best thing you can do is move your price point to either $2.99 or $0.99, whichever you’re more comfortable at. The stats tell us that either of those two price points will perform better than $1.99. If the book is truly small, $0.99 may be the way to go for you — yes, it’s less money, but it may bring in more sales overall. Alternately, you could always experiment with the $2.99 price point, too. Perhaps run a promotion on your (previously $1.99) titles, offering them at $0.99 for a month or so before putting the prices up to $2.99? We’ve seen people have good success with methods like that. The lower price point entices new readers in, and once you’ve generated interest in your titles, the sales often survive the hike to a higher price point.